Halloween parties are my absolute favorite and I know I’m not alone there. They’re so easy to pull off because just about anything goes and it’s such a fun time of year. I’ll be the first to say party planning is not my strong suit, I’m usually scrabbler to get them together roughly 15 minutes before the guest arrive. But it doesn’t have to be that way for you! 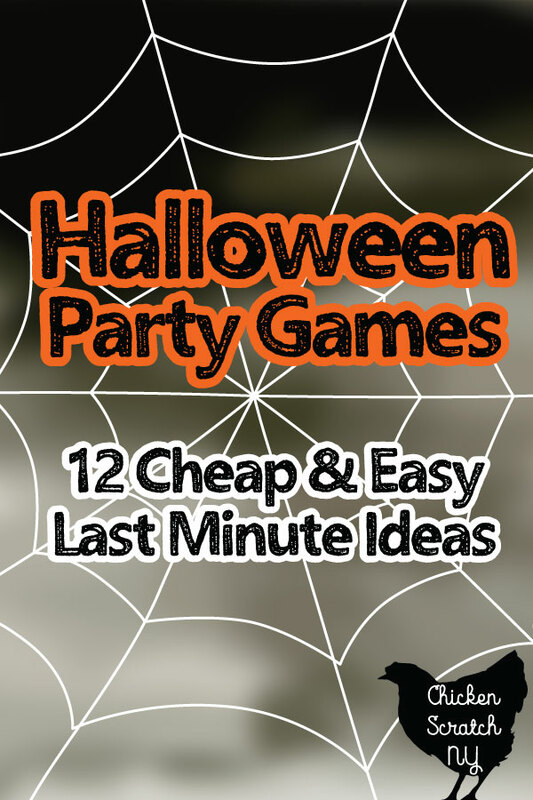 Today I’m sharing 13 easy Halloween party games to enjoy at your next party. Some of them are pretty holiday specific but others can be altered to fit just about any party theme. Your younger party guests might need a bit of help with charades if they can’t read yet but it’s no reason ot to play! Who doesn’t like acting out the roll of a zombie or trick or treater? To make your life a little easier I have two printable pages for Halloween Charades for you! I made you a generic Halloween Charades page and another page with Halloween Movie Charades which is more appropriate for an older crowd. You’ll want to be outside for this one! Tie a bunch of strings to a tree branch or across any sort of beam about 2 feet apart. The strings need to go about 2-3 feet off the ground. Line up the kids and tie a donut to each string. Line it up so the donut is about even with the kids mouth. The winner is the first person to eat their donut with out using their hands. Avoid using donuts with powdered sugar, you don’t want anyone choking! We usually use cake donuts but they tend to tear right through the string if you tie them too tight. Can you have any autumn party without this classic? I was probably 13 the first time I went bobbing for apples and I never looked back. It is a messy activity that you’ll want to do outside and keep lots of towels on hand. Limbo is a game that favors the short. Even though I’m 5’10 I’m flexible enough to make it past the first few rounds then I get knocked out by all the kids in my family. Maybe this is a little too school like to hold their attention during a smashing Monster Bash but don’t knock it till you try it! You can also hand out printed word searches as parting favors to keep the kids busy while the parents recover from the party. 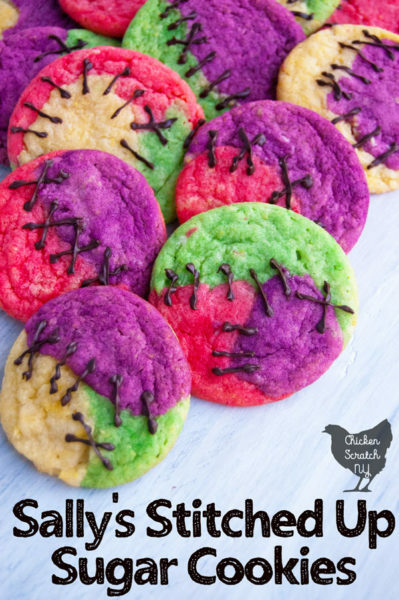 I don’t know about you but I always need a nap after watching my monsters go crazy on sugar cookies and party game! 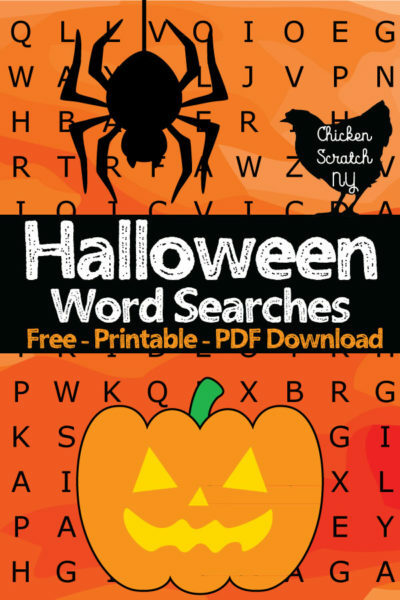 I also have a fun Halloween Crossword Puzzle available for free! This game requires a lawn, a skeleton arm and rings. I ended up using glow stick necklaces for rings, my kids are nuts about them and they’re cheap to pick up at the dollar store or the Target dollar spot. The skeleton arm I used came from Joann’s but every store seems to have it’s own line of bony friends. I stuck my arm in the lawn and let the kids go nuts but if you don’t have a stab-able surface you can fill a flower pot with rocks for weight and a block of floral foam. Stick the arm in the arm in and game on. 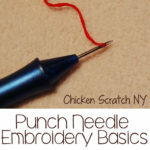 You’ll only need a little bit of creative skills to pull this off. First, head to the dollar store and grab a sheet of white poster board. Next, make a web with a black marker or washi tape (or even electric tape if that’s what you have hanging around!). 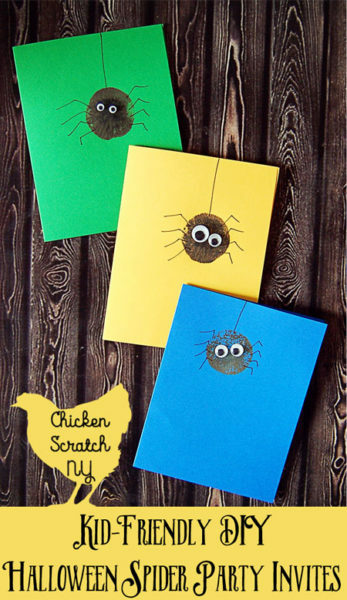 Grab a pack of paper or foam spider shapes from the dollar store or the craft store (or cut them out your self) and write a name for each child with a silver marker. Stuck a tape loop or a glue dot on the back. Inform all your guests that the goal is to get the spider into the center of the web, then blind fold and spin them. If you’re playing with my sister I recommend blindfolding her and then placing a large bucket over her head so she can’t cheat. She’s still going to cheat but at least make it fun for yourself right? The Halloween version of this family friendly favorite is played just like the regular game, but with better music. Our favorites are the Ghost Busters theme song, This Is Halloween from The Nightmare Before Christmas and The Addams Family theme. 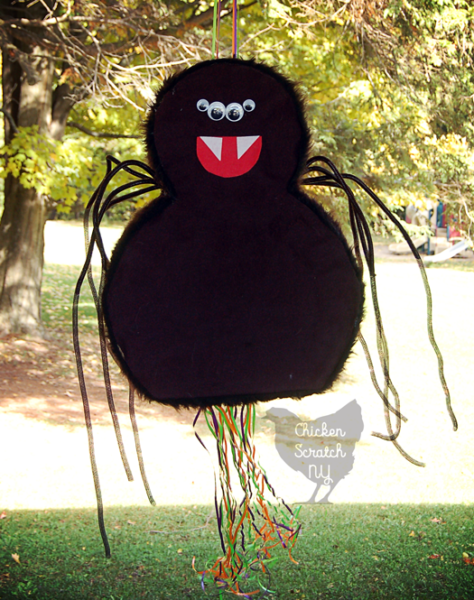 Halloween Parties are a great time to pull out a pinata, even better if it’s a giant spider! My DIYd giant spider pinata is named Irving and he’s been a happy guest at two Halloween Birthday parties so far. 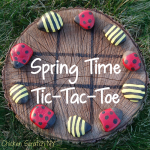 This is the perfect time of year to fill a pinata with fake bugs and other icky, squishy treats that wouldn’t fly in April! It’s also the easiest time of year to find mini candy treats. Other fun fillers include glow sticks and vampire fangs. 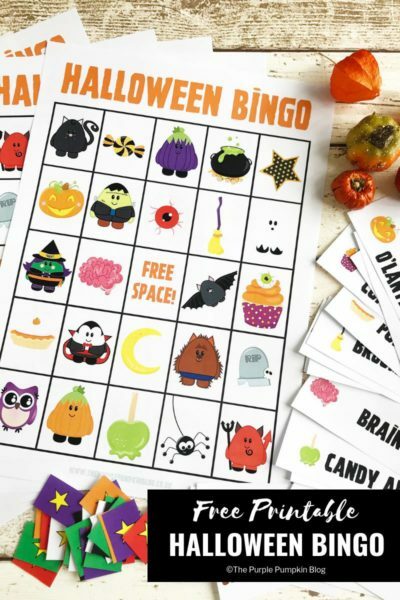 Grab a few sheets of Halloween stickers and paper bags to collect the candy for a bonus activity. 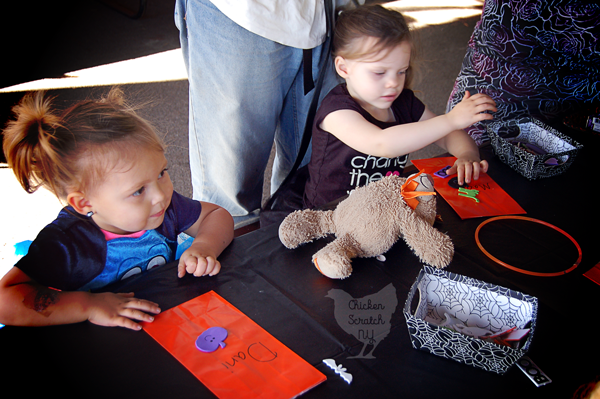 I think the kids has almost as much fun decorating their treat bags as they had filling them with the pinata goodies. I’m sure you’re familiar with the guessing game where everyone writes down how many of something is in a jar right? For this Halloween version I pulled out a bag of fake spiders from the dollar store. All the legs make it extra hard to count! If you aren’t feeling the spiders you can go with candy corn or any spooky Halloween version of you favorite candy! 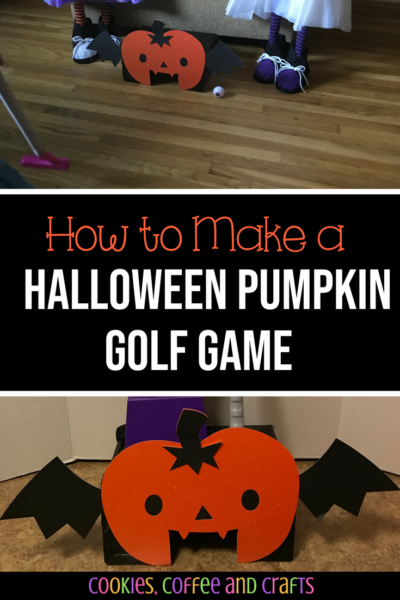 I am completely in love with this Halloween Themed DIY mini-golf game from Cookies, Coffee & Crafts. I might be a bit biased, my boyfriend and I went on a glow golf date last weekend without the kids and it was so fun. I would love to let them play at home and you can’t get cuter than a little pumpkin bat hole can you?! I hope you’ve found a bunch of easy ideas to get you Halloween party off to a (cheap!) and fun start. Don’t forget to PIN this for later! Thanks for sharing the fun ideas! We will be using several at our next Halloween party!